What is better than playing against one of the best football clubs in the world? Being trained by them. Never in a million years did they thought that they will be able to see the world’s #1 ranked football club, FCBarcelona, in action, much less interact with them. But these promising young football talents from Tondo did just that and more. Thanks to the sponsorship of Alaska Milk Corporation, the five Futkaleros— Champ Cyrus Wico, Jonas Lorens Lavarias, John David Espiritu, Maria Rochel Mendaňo, and Roger Batiugas— were able to train under the FCBarcelona coaches Jordi Blanco and Jose Moratalla during the FCBEscola Philippines Barcelona Soccer Camp for the youth, a sports workshop that did not only aim to teach Filipino kids the rudiments and techniques in the game but also share with them the FCBarcelona values of teamwork and hard work. “Alaska has been there from the very start, even at that time when football was not very popular. It has been supporting the grassroots development of the sport and in training players. The annual Alaska Cup, is in fact, the biggest cup in the country, with thousands of players in a single day. So we were not surprised that Alaska lent their support to this project,” says Michael Reyes, organizer of the camp and Team Socceroo’s captain. Alaska Milk Corporation brings FCBEscola, the world’s No. 1 ranked football club here in the Philippines to help develop children through sports programs such as the FCBEscola Barcelona Camp. The FCBEscola Barcelona Camp has already begun training kids last April 17 and will continue until April 21 at the Ayala Alabang Country Club. 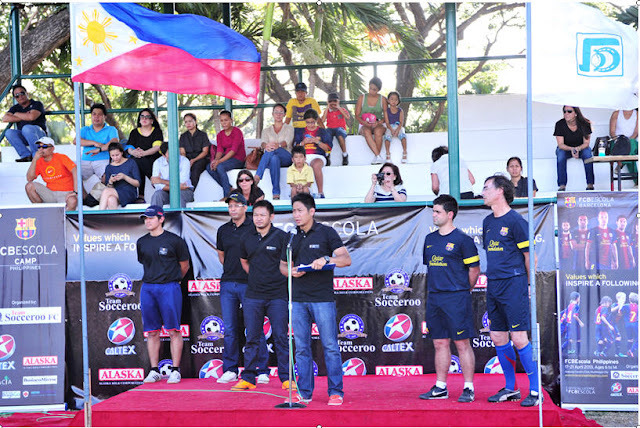 According to the organizers, the Futkaleros have the typical Filipino built, which unlike basketball, is suited to football. Filipinos are not as tall as other kids but they compensate with their incredible speed and agility. FCBarcerlona has members who have similar built but are still able to excel. In football, built is not as important as technique. “The style of football of FCBarcelona is the ‘most fit’ and ‘most matched’ [style] with Filipinos. They do not rely on size. In other sports, if you are big, you’d be a better player. In football, we rely more on technique, the passing, how the team plays. FCBarcelona’s style of football is not very individualistic. It emphasizes team play,” says Nicholas Reyes, FCBEscola camp organizer. There is also no age requirement, just a healthy body, good attitude and passion for the sport. Reyes emphasized good nutrition at an early age “as this will give children an edge in the sport.” Both exercise and proper diet are essential, especially to the significant number of Filipino kids, who have been found to suffer from undernutrition and overweight problems (National Nutrition Survey of FNRI-DOST, 2008). It is recommended that they eat a balanced set of meals and do more physical activity, which Alaska Milk Corporation has been advocating through their sports programs.